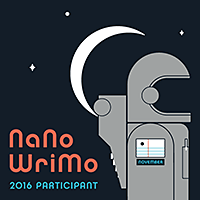 The NaNoWriMo novel 50k writing marathon is under was as of midnight November 1st. Below is my monthly progress. Green = good, met daily average. Yellow = okay, about have daily goal. Orange = I wrote something. Red = nothin' written and that's okay, but want minimum red.